Familiarity with the first three chapters of Genesis is critical as it is here that we see God’s original plan, how we messed it up and the first hint that He has had a solution from the beginning. In my post in April we looked at the fallacies that have been put forth about the creation of human beings in Genesis 1 and 2. Today we will start to explore the events recorded in Genesis 3 on the temptation and fall. We have all met the father of lies, the problem is that often we don’t recognize him for who he is. What have we traditionally been told or taught about how we fell into sin has been touched and twisted over the centuries by the master of lies. Words are how we communicate, but words in English do not always convey the understanding that we would have if we knew Hebrew. Translation is affected by tradition and culture so it is important to check out key words to get a more complete definition in the original language. The very word serpent deserves a closer look. Serpent is the Hebrew word nahash which means to hiss and whose root word means divination, sorcery or enchantment indicating the occult. It is followed by the word cunning (aruwm), also translated subtle, indicating crafty and shrewd. This is no common snake. What is the tempter doing here? Adam was told in Genesis 2 to “keep” the garden. The word keep in the Hebrew, (shamar), means to hedge about, i.e.–guard, protect, attend to, indicating that there must have been something from which it needed to be protected. The same word is used in Genesis 3:24 when it refers to the Cherubim keeping the way to the tree of life. Although scripture tells us that the woman was created at the same time as the man, she was not formed until Genesis 2:22. The command was given in Genesis 2:17. Was the essence of woman aware of the commands prior to being formed? We don’t know. We do know that she adds to God’s words. Why? Was it because she had not heard directly from God? Taught wrong? To add stress? Exaggeration? We don’t know—the Bible does not say thus all we can do here is speculate. However, the actions of Satan are clear: as he proceeds he calls God a liar. Satan insinuates that God is trying to keep something from them. He states what we know to be his own desire to be like God and tempts them to have those same desires. He does the same thing today, using subtle strategy to lead us into disobedience. 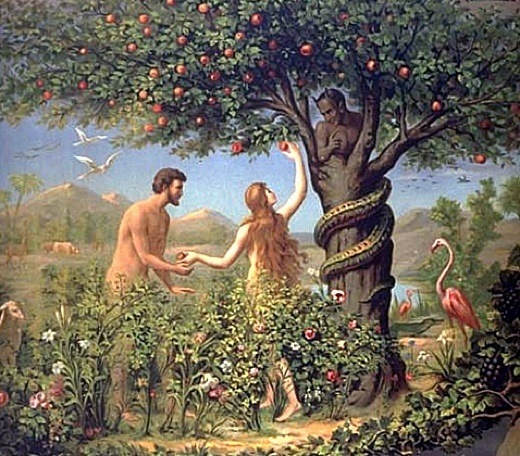 Genesis 3:6 “So when the woman saw that the tree was good for food, that it was pleasant to the eyes, and a tree desirable to make one wise, she took of its fruit and ate…. The woman was tempted in body (good for food), soul (pleasant to the eyes) and spirit (make one wise) We are easily deceived by allowing our natural senses rather than God and his Word to be the standard by which we make decisions. Adam knew what was happening and he chose neither to warn the woman nor to stop her from eating and he chose to eat himself. Gilbert Bilezikian says the words “with her” are the saddest words in the Bible. Adam was told to keep = guard the garden yet he let the tempter come in and made no move to make him leave. Adam heard the whole conversation. He never said a word to stop Satan. Scripture says he was not deceived. He knew exactly what Satan was doing, yet he allowed his wife to eat. Then he ate. Did he watch to see what happened before he ate? We don’t know. We do know that Adam ate fully knowing that what he was doing was against the command of God. Who is responsible for the fall of humankind? The Bible lays the responsibility entirely on Adam. In the New Testament Paul says Adam was not deceived and places the full responsibility on him in Romans 5:12-19, 1 Timothy 2:14 and 1 Corinthians 15:22) So why is the woman blamed for the fall? Up until around 200 or 300 B. C. she was not. We’ll take a look at what happened in our next session. Transgression = rebellion and iniquity = vanity and perversion of spirit. Had you ever noticed that it says commanded the man. Just what was it that was commanded? “May freely eat” sounds like giving permission but in the Hebrew there is a different connotation. “Neither the words may or freely indicate God was leaving the ‘if, when, or how much to eat’ to Adam’s own discretion. Adam, having free will, could choose not to eat of the provision God had made, but it would be in direct disobedience to the command.” Spiritual food was available from the tree of life, the very life of God, yet Adam evidently did not choose to partake of this provision for “keeping” the garden. It is a principle of Scripture that God offers provision before He gives us a job. The ability to “keep” the garden would come from partaking of the tree of life. Romans 5:12-19 (NKJV) 12 Therefore, just as through one man sin entered the world, and death through sin, and thus death spread to all men, because all sinned 13 (For until the law sin was in the world, but sin is not imputed when there is no law. 14 Nevertheless death reigned from Adam to Moses, even over those who had not sinned according to the likeness of the transgression of Adam, who is a type of Him who was to come. 15 But the free gift is not like the offense. For if by the one man’s offense many died, much more the grace of God and the gift by the grace of the one Man, Jesus Christ, abounded to many. 16 And the gift is not like that which came through the one who sinned. For the judgment which came from one offense resulted in condemnation, but the free gift which came from many offenses resulted in justification. 17 For if by the one man’s offense death reigned through the one, much more those who receive abundance of grace and of the gift of righteousness will reign in life through the One, Jesus Christ.) 18 Therefore, as through one man’s offense judgment came to all men, resulting in condemnation, even so through one Man’s righteous act the free gift came to all men, resulting in justification of life. 19 For as by one man’s disobedience many were made sinners, so also by one Man’s obedience many will be made righteous. 1 Cor. 15:22 For as in Adam all die, even so in Christ all shall be made alive. 1 Tim 2:14 And Adam was not deceived, but the woman being deceived, fell into transgression.